We will make a Christmas gift that is an easy and simple DIY project. 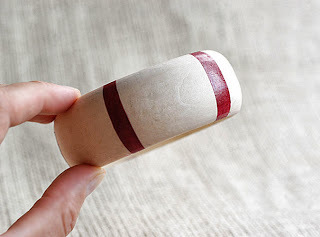 We will need a wooden bracelet, a few nail polishes and a roll of masking tape. The wooden bracelet should be plain wood. Such bracelets could be purchased on-line or in craft shops. I suggest you try it on before starting a project. It would be a disappointment if once you finish painting your bracelet won't fit. Look at your nail polish collection and select a few nail polishes that match. We will use them as our paint. They are very durable and have a nice luster. Masking tape will help us paint the pattern we design. To start apply masking tape to the bracelet. Make sure the tape is adhered well to the wooden bracelet. Otherwise you will have paint spills and the bracelet will look messy. I will paint a pattern of stripes on my bracelet, thus, I'll apply the tape so that there are stripes of untreated wood. 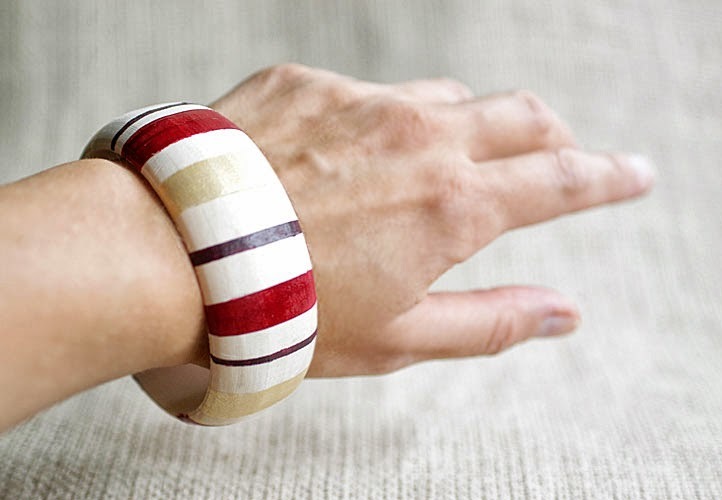 I'll leave 4 or 5 untreated wood stripes on my bracelet. 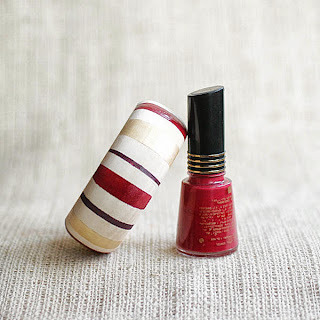 Now color wooden stripes with the same hue of nail polish. Once the polish is dry slowly remove the masking tape. You will see nice colored stripes on the bracelet. 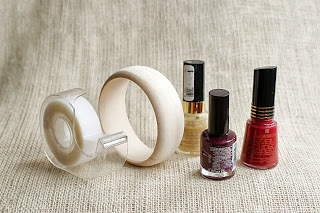 Now apply a new set of masking tape to color the bracelet with a new nail polish shade. Repeat as many times as nail polish colors you have. 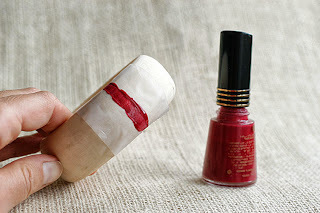 Make sure the nail polish is dry and the masking tape is adhered well. I like to mix colors without any rule or pattern, thus, a dark red color may be followed by a golden hue and then by a dark purple one. Then I change the order. I change stripe sizes as well to make my bracelet look special and creative. this is a great way to use old nail polish! Do you paint the inside of the bracelet too? I'm glad you stopped by! As an artist I'm happy to share my creative ideas with you. Feel free to comment and discuss as I very much value and appreciate your attention, opinion and your thoughts!